Make something lighter and healthier to get off to good start on your New Year's resolution to lose weight. Most of us last a week trying to make good on the promise(s) we make to ourselves as another year rolls around. What is it about sticking to to a promise that always seems to go awry?? Here is a no guilt really healthy dish that is a cinch to make and tastes great. 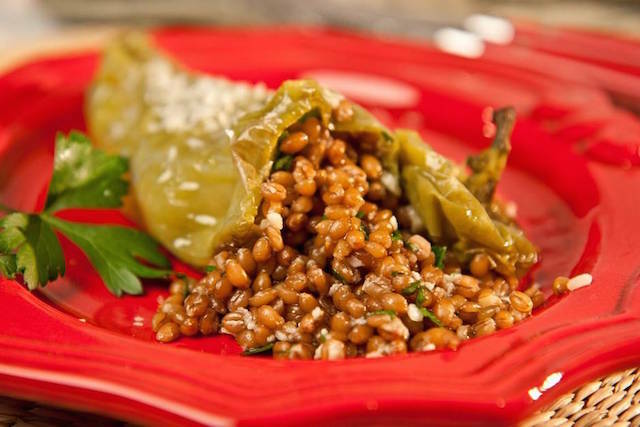 This dish tastes best when made with farro, a strain of wheat that packs a lot of protein and fiber but you can make the dish with brown rice or orzo. So eat up and look good! Cover the farro, rice or orzo with the broth or water in a one-quart saucepot. Bring the pot to a boil, lower the heat to simmer, cover the pot and let the farro cook until most of the broth is absorbed and the farro is tender. Drain the farro in a colander and transfer it to a medium size bowl. Stir in the egg white, cheese, parsley and 1 tablespoon of the oil. Set aside. Cut down 1/2 inch off the stem tops of the peppers and set aside. Tap out the seeds in the peppers or use a small spoon to remove and discard them. Fill the peppers with some of the farro mixture but do not pack them too tightly, otherwise they may split while baking. Make a small incision on the side of each pepper with a small paring knife to allow steam to escape while baking. Brush a medium size casserole dish with the remaining olive oil and place the peppers in a single layer in the dish. Cover the dish with aluminum foil and bake them at 375 degrees for 30 minutes. Uncover and bake 5 minutes longer. Drizzle the tops of the peppers with extra virgin olive oil. At what oven temperature do you bake this dish?